The origin of this countryside residence, once called a casino or palazzo (palace), dates back to 1783 when record of an agricultural fund denominated “del Palazzo” is found listed among the properties of the Counts of Zambeccari. In 1812, the main house, which was connected to the farmer’s residence, featured on its ground floor a spacious entrance loggia, three large rooms and a north-facing storage area. The upper floor was comprised of ten rooms. Two years later, both levels were enlarged with new areas, in part for living and in part for grain storage in the attic. The villa was further enlarged to its current dimensions, including the surrounding park, in the second half of the 19th century by Count Gaetano Zucchini and, following his death in 1882, by his son Antonio. During this period the owners spent little time at the property and management of the complex was entrusted to the farmer. Later on, from 1922 to 1942, it became the principal residence of Rigoberto Smeraldi, who personally managed the agricultural business and raised thoroughbred horses. Rigoberto Smeraldi and his wife Maria Selmi had no children of their own, but were very close to Rigoberto’s nephew Antonio Roversi, who was also the husband of one of Maria’s nieces. Roversi spent summers at the villa with his wife Clementina Colombo and their children, one of whom became a well-known writer and poet, Roberto Roversi. The familial ties with Rigoberto and Maria led Antonio to purchase the entire property following the death of Rigoberto in 1942 and of Maria a few years later. During the Second World War the ground floor loggia and other spaces were rented to the Timo telephone company. The rest of the villa was occupied by a German command, and at war’s end, by numerous families who had lost their homes and stayed on after the war was over. The villa was poorly maintained in this period and was not used again by the owners for a number of years. 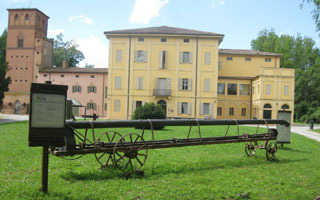 The desire of the Roversi family to maintain the integrity of the residential complex led to the purchase of the villa and park by the Province of Bologna in 1970 to create the Museum of Peasant Farming Culture. Today the villa houses temporary exhibits and a conference room on the ground floor; the museum’s photo archive and library are located upstairs.